The Talmud ascribes to the goat great strength, endurance (Beẓah 25b), and pluck (Shab. 77b). Job's goats killed the wolves which assailed them (B. B. 15b), and Ḥanina's would bring bears upon their horns (Ta'an. 25a, and parallels). Goat's milk fresh from the udder relieves pains of the heart (Tem. 15b), and that of a white goat possesses especial curative properties (Shab. 109b). Against diseases of the spleen the same organ of a goat which has not yet borne young is recommended (Giṭ. 69b). Among the manifold uses of the goat may be mentioned, in addition to those given above, the making of its horns and hoofs into vessels (Ḥul. 25b). 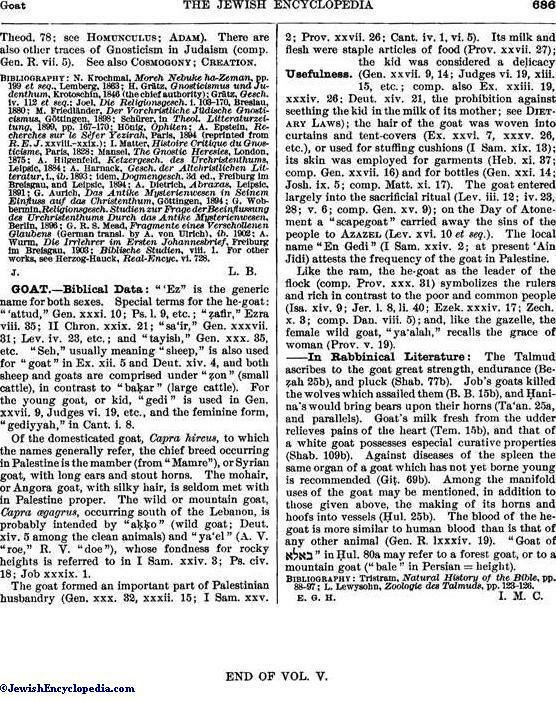 The blood of the he-goat is more similar to human blood than is that of any other animal (Gen. R. lxxxiv. 19). "Goat of " in Ḥul. 80a may refer to a forest goat, or to a mountain goat ("bale" in Persian = height).